In a Nutshell: Younger shoppers have shown a preference for affordable, unbranded items over expensive, brand-name products. Tophatter caters to those consumers and the changing e-commerce landscape with its discovery shopping app that features a fast-paced auction format, enabling consumers to snap up great deals in the nick of time. The app encourages consumers to discover items by browsing, not searching. A fun alternative to traditional online shopping, the user-driven discovery model draws in consumers and keeps Tophatter top-of-mind for deal-hungry shoppers. As discount and auction sites compete for who has the lowest price and the best customer experience, one company has created a format that combines the best aspects of both — and a little gamification, too. Tophatter, an e-commerce auction app, offers a fun shopping experience that allows consumers to discover high-quality, mostly unbranded items at steep discounts. The concept is simple, yet refreshingly unique. The Tophatter app displays auction items that you might be interested in, all of which are for sale at a significant markdown from retail price. In many cases, users can find discounts of 80% or more. But users have to strike fast as items only last about 60 seconds before the auction ends, although each bid extends the auction by 10 seconds. Consumers must quickly decide whether to bid on an item or it may disappear. 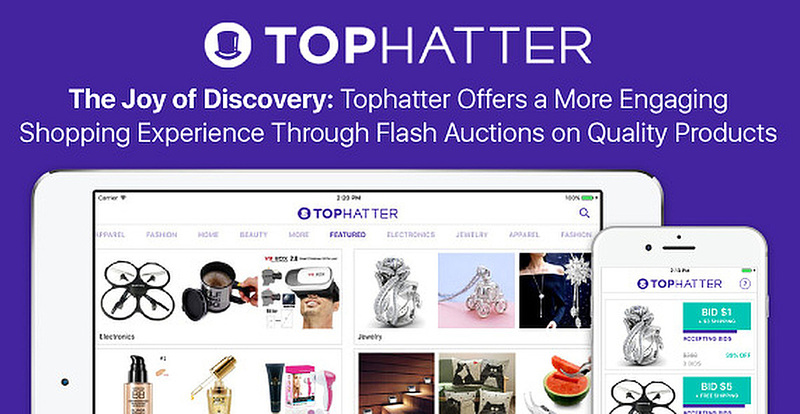 Since its launch in 2011, Tophatter has grown considerably by innovating an instantaneous auction experience that differentiates it from the most prominent auction sites on the web where bidders may have to wait a week to find out if they won an item. Tophatter’s popularity has increased along with consumer demand for immediate savings on their own terms. Over the years, Tophatter has advanced its technology and improved its interface to keep true to its core concept of providing a fun way to shop on a mobile device. Brands are always looking at how the latest technology can help sell products, but mobile shopping has been one of the biggest areas of growth in the retail industry. “Mobile has changed the way people shop,” Andrew said. And Tophatter is making a name for itself in the industry as it offers both value and a unique buying experience. Studies have shown that many millennials are no longer interested in paying high prices for brand names. One of the reasons why Tophatter can sell products at such dramatic discounts is that most of the items on its site are unbranded versions of popular products. Unbranded items are often made with the same quality as their brand-name counterparts, but they don’t carry the high brand markup. “Consumers increasingly care less about brand and more about getting a good deal,” Andrew said. Tophatter chooses items to list and promote based on that trend. Historically, people have been attracted by brand-name items because they carried on a legacy of company success that could have spanned decades. However, the decline of brick-and-mortar stores and the rise of e-commerce has made many brands less relevant, with some even disappearing completely from the market. Andrew believes that this shift is part of larger market changes that will ultimately help Tophatter’s business grow. Mobile technology and the internet have changed our lives. Today, when it comes to ordering food, goods, and services, consumers expect to have a digital option as the shop. 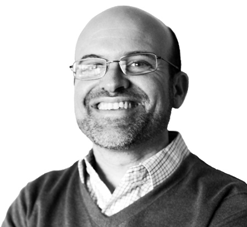 Tophatter COO Andrew Blachman spoke with us about the site’s unique auction format. The element that differentiates Tophatter from the rest of the digital pack is its format, which allows consumers to discover items organically. The app doesn’t have a search function, so shoppers experience products similarly to shopping in a mall. Customers often enter the app without knowing what they’re looking for and end up having a moment of discovery in which they unearth a gem. Tophatter’s variety and value encourage consumers to take action which drives sales and interest even among casual shoppers. “Consumers want deals and opportunities pushed to them — the key is pushing the right deal to the right consumer,” Andrew said. Plus, because the auctions put a time limit on items and deals, Tophatter engages consumers emotionally and inspires more immediate action. Tophatter tends to be more engaging than other shopping channels because it provides an exhilarating buying experience for users. Shoppers see an item they want and must bid on it immediately, creating an adrenaline rush. The gamification of shopping in this format also keeps consumers coming back for more. “Engagement is a much better indicator of long-term value to us. A consumer might not buy something today, but maybe they’ll come back tomorrow, or a week later, and buy something,” Andrew said. Another issue that many e-commerce marketplaces face is that their deals don’t change often. But Tophatter’s inventory is always rotating, ensuring that consumers see new items and new deals on every visit. In the 2-minute clip above, a customer talks about how she ‘discovery’ shops on Tophatter. The company layers on machine learning to track what a person liked and what they didn’t like the last time they opened the app to adjusts what’s shown to users. “We’re experimenting with more explicit, user-driven personalization, but most of what we do today is passive,” Andrew said. Having a passive, personalized experience works better than an active one, Tophatter finds. That’s because asking consumers questions about personal preference — such as their size or favorite fabric — often pushes them away. Additionally, Tophatter doesn’t feel the need to have a more active system because its algorithm is so accurate. The company’s technology uses an intelligent tagging system that determines what items to push when and to whom. Tophatter believes that its use of discovery shopping — as opposed to searching — serves a vast, untapped market. While other e-commerce retailers and auction sites dominate the search market, Tophatter is making a name for itself in e-commerce thanks to its unique technology and value proposition. Andrew and the rest of the Tophatter staff have been analyzing trends, and the group believes that the way millennials — and even older generations — are shopping now is in line with where the company is headed. In the short term, Tophatter is testing ways to improve features within its app. The company is mostly focused on its long-term impact of its discovery-driven shopping philosophy and how it will attract consumers of the future. If past success is any indication, Tophatter’s future looks bright.